People aren't the only ones in need of antioxidants to neutralize free radicals. Scientists have long known that plants use their own vitamin C to reduce oxidative damage. Now, Agricultural Research Service scientists are looking into ways that plants use vitamin C to defend against ozone, which damages more plants than all other air pollutants combined. Stratospheric, or upper-level, ozone protects Earth from harmful ultraviolet radiation. But tropospheric, or ground-level, ozone, is a pollutant. Tropospheric ozone results when air pollutants react with oxygen in the presence of sunlight to form a molecule with three highly charged oxygen atoms (O3). Tropospheric ozone enters plants through their leaves and decomposes into unstable molecules called reactive oxygen intermediates (ROIs). If not neutralized by an antioxidant, ROIs injure plants. At the Air Quality-Plant Growth and Development Research Unit in Raleigh, North Carolina, plant physiologist Kent Burkey is studying how plants transport vitamin C out of their leaf cells and into a complex of adjoining cell walls. This outer cellular space is called the apoplast—an interconnected liquid layer surrounding the cells. "We've found that plants that are able to move greater quantities of vitamin C into the leaf apoplast have a better chance of detoxifying ozone," says Burkey. He has evidence that ozone tolerance in snap beans is associated with elevated vitamin C in the leaf apoplast. He has also found that plants vary widely in terms of how much vitamin C they make inside their cells. "But that doesn't seem to be related to how tolerant they are," says Burkey. While some plants make lots of vitamin C in their cells, they are not capable of transporting it into the apoplast, where it could provide protection against ozone injury. After vitamin C neutralizes ROIs, the vitamin C itself becomes oxidized into dehydroascorbic acid (DHA). The plant then moves the DHA back into the cell where it is reduced, or revitalized, into vitamin C, which is once again available for transport back into the apoplast to fight ozone. Questions remain about the protective importance of vitamin C stored in the apoplast before ozone exposure versus vitamin C that is pumped into the apoplast in response to ozone stress. 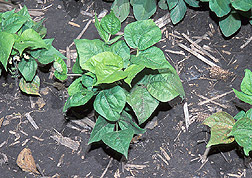 But Burkey's most recent tests on snap beans suggest that the presence of vitamin C in the apoplast before ozone enters the leaf is critical. He will next look more closely at how vitamin C and DHA are transported between the cell and the apoplast. And he will look for other antioxidant compounds in the leaf apoplast that could protect against ozone injury. Burkey hopes the research will lead to finding genes associated with a plant's ability to pump vitamin C into the leaf apoplast. "You could potentially develop plants with greater ozone tolerance," he says. "Once you have the gene, you could express it in other plants using molecular techniques. "—By Rosalie Marion Bliss, Agricultural Research Service Information Staff. This research is part of Air Quality (#203) and Global Change (#204), two ARS National Programs described on the World Wide Web at http://www.nps.ars.usda.gov. Kent O. Burkey is with the USDA-ARS Air Quality-Plant Growth and Development Research Unit, 3127 Ligon St., Raleigh, NC 27607; phone (919) 515-1620, fax (919) 856-4598. "Vitamin C Protects Stressed-Out Plants" was published in the January 2003 issue of Agricultural Research magazine.